Click here for the full list of companies covered. Integrated multicore processors are now the heart of almost every type of networking device, enabling network system developers to support network functions in software, and to support industry developments such as software-defined networking (SDN) and network functions virtualization (NFV). Multicore processors are highly integrated system-on-chip (SoC) devices with up to 72 cores and hardware acceleration for security and low-level packet processing. Multicore processors can be programmed in C or other high-level languages and are directly supported by multicore operating systems and applications software from companies such as 6WIND, Enea and Wind River. Integrated multicore processors are becoming the dominant processor solution for networking applications. Network processors, originally developed to provide programmable high-speed packet processing, have been replaced by integrated multicore processors for all but the most demanding applications. Many multicore processors integrate hardware acceleration engines that were originally developed for network processors. 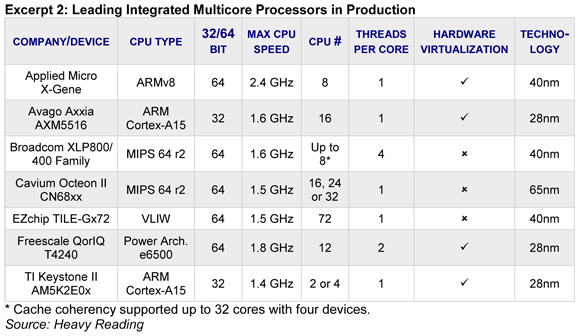 General-purpose multicore processors have become steadily more integrated. Intel and AMD have general-purpose multicore processors for high-performance applications and integrated multicore processors for lower-performance applications. Both companies are developing integrated multicore processors that will address high-performance networking applications. The market for integrated multicore processors in networking continues to grow. Many companies are using common platforms with multicore processors for a wide range of applications, including SDN and NFV. This reduces development costs and allows telecom equipment makers to deliver flexible networking functions on standardized platforms, with hardware acceleration where necessary. Most processor vendors now have a range of devices with different numbers of cores and hardware acceleration engines, allowing system developers to meet a range of different performance and functional demands using multicore processors that are software-compatible across all their systems. Integrated Multicore Processors for the Software-Defined Network: A Heavy Reading Competitive Analysis surveys high-performance multicore processors for networking applications. The report also reviews the strategy, product mix and product architectures of 15 multicore processor, intellectual property (IP) and software vendors. As such, the report provides not only granular information on the components themselves – of interest to chip manufacturers and purchasers – but also insights into how the overall market for multicore processors is likely to develop – of interest to a wide audience, including carriers and investors. This report delivers a complete competitive analysis of multicore processors, IP and software, covering more than 80 products from 15 components suppliers. It offers detailed information on all types of high-performance multicore processors, covering key product features as well as power, package and availability. In-depth interviews with component suppliers conducted for this report offer insight into how the market for multicore processors is likely to develop. The excerpt below shows a typical fourth-generation integrated multicore processor. At the center are two 64-bit RISC cores. Some devices integrate floating-point units and enhanced instruction sets for networking related functions. Each core has instruction and data caches, typically 32KB to 78KB each. The RISC cores are closely coupled to multiple Level 2 caches, which are typically shared between two cores averaging 128KB-512KB per core. Several multicore architectures support hardware multithreading, in which each core runs several threads in parallel, switching between threads as hardware resources become available. This increases processor performance per core but requires additional resources in each core. There are seven manufacturers with integrated multicore processors in production: Applied Micro, Avago, Broadcom, Cavium, Freescale, EZchip and Texas Instruments (TI). The highest-performance product from each company is shown in the excerpt below. 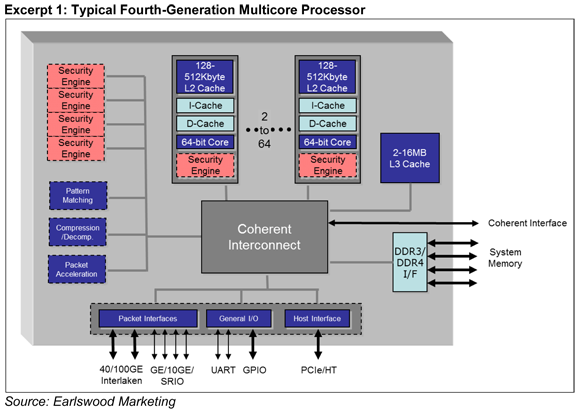 Section II presents an overview of multicore processor applications and architectures, including generic block diagrams. It also covers multicore IP and software with architecture diagrams. Section III focuses on general-purpose multicore processors, including detailed vendor profiles, architecture diagrams and a competitive analysis of products now in production and announced products not yet available in production quantities. Full details for these products are presented in Appendix A. Section IV examines integrated multicore processors, with detailed vendor profiles, architecture diagrams and a competitive analysis of products both current and forthcoming offerings. Full details for these products are presented in Appendix B. Section V explores 10- to 500Gbit/s network processors, including detailed vendor profiles and a competitive analysis of products both current and announced. Full details for these products are presented in Appendix C.
Integrated Multicore Processors for the Software-Defined Network: A Heavy Reading Competitive Analysis is published in PDF format.